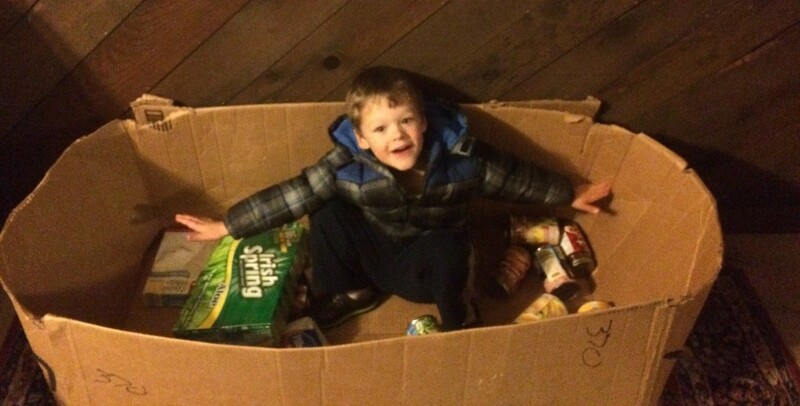 My son’s spontaneous food drive last year. I hear these sentiments about charitable giving all the time, and each one conveys a piece of the complicated puzzle that is generosity. Yet each could also represent a misconception about philanthropy. Last month I shared my belief that the purpose of money is to provide for needs and wants, for myself and others, now and in the future. We dissected wants. Vs. needs, and probably ended up more confused, though grateful, than we started. This week let’s look at the next part, “for myself and others.” We’ll explore different types of giving, and I’ll make the case for one approach you can’t afford to skip. Both are valuable and important. And there can be overlap between these categories. But we’re not going to count our familial Christmas shopping as philanthropy. I love giving and receiving thoughtful gifts, but personal gifts—even very generous ones–can’t and shouldn’t replace charitable giving in your financial plans. Giving to those outside your own tribe cultivates compassion in a way that guards against greed and grows your real worth all at once. Many people practice spontaneous giving. Perhaps it’s the Boy Scouts selling popcorn, the Salvation Army Santa outside the grocery store at Christmas, or the community food drive. Then there are the urgent calls for disaster relief or refugee care. Being able to respond to needs in the moment is incredibly important. These are times when compassionate, spontaneous giving is invaluable. If we rely on spontaneous giving alone, we will not give as generously as if we plan ahead. Yes, it’s more work up front. Yes, it will require more money. But it also allows for a long-term partnership where you know your money is actively and effectively helping others on a regular basis. We plan ahead for ourselves with emergency funds and retirement accounts. It only makes sense to plan ahead to help others, as well. There’s a reason many of the world’s faiths call upon followers to give away a portion of their income, such as ten percent. I don’t believe 10% is a magical number or even required by my faith, but it’s a good starting point. Choosing a percentage is helpful because it’s easy to feel like I’m doing so much good because I’m giving away $50 a month! That’s a great starting point, but if you’re making a median $51,900 per year, you’re giving away a whopping 1%. It’s also easy to give less (percentage wise) as your income increases by simply giving the same amount you always have. The average individual American charitable giving by percent is lower for those with higher incomes. Whatever percent or amount you choose, please choose ahead of time! We read all the time about why we should save a certain percent, invest a certain percent, don’t let housing costs exceed a certain percent, etc. Plan your giving like you plan your saving, investing, and spending. If you believe sharing is part of what money is for, grant giving the forethought and importance it deserves by choosing what to give ahead of time. We choose the causes we want to give to, then the amounts we want to give. Next we add ’em up and see how that compares against our income, i.e. the percentage. Then we can adjust the amounts and/or causes as we see fit. Finally, we sign up to have these auto-drafted from our checking account monthly, just as we do with most of our expenses and investing. Giving to urgent needs is determined as they arise. All types of giving are valuable, but planned, consistent giving is the key to unleashing more funds toward improving our world. I believe many people would be moved to greater generosity if they thought of giving as a strategic financial commitment. If it’s truly better to give than to receive, let’s plan to make giving happen. What type(s) of generosity do you practice? Has anyone found they give more when they commit ahead of time? 100% yes. I wrote a post that shared my thoughts on giving. It basically boils down to you don’t have to, but you absolutely should. And then I gave myself permission to stop following a big name in blogging who is really vocal about only giving “some day”. Nope. Not for me. We don’t give as much as I would like, but we budget for $200 a month. And sometimes that includes ingredients to make a meal for a sick coworker or something like that, but more often, it’s for our local food bank, literacy programs, and other causes that are near and dear to our hearts. It really is my favorite spending! That’s great that you budget for giving a certain amount each month. Making that choice ahead of time is a great way to practice what you value. I’ll have to check out your post on the topic because it sounds like your philosophy is very similar. Of course you don’t have to give, but it only makes sense to in my eyes. The low income family program you partnered with sounds awesome! It can take some time to find the right group to donate to. I deleted my caveat about this, but choosing to give a percentage of income means if you don’t have an income, you don’t give. That’s fine. Get back on your feet, and let that desire to give motivate you to improve your financial status. I think what to do when you’re deeply in debt is a complicated, personal decision, but to ignore some of the Bible’s tenets about avoiding excessive debt and then cite the belief that God will provide, is a bit contradictory, or at least confused. Volunteering our time and energy is something we do regularly. Lending a hand, showing support, etc is a great way of giving back. We do donate monetarily as well. We have not been consistent in the organization or causes we donate too, but continue to looking for opportunities that are most needful. I agree that volunteering is an integral part of a good life, and one we’ve structured our schedule around. And sometimes time can be more of a sacrifice to give than money. Both are important, and staying open to the needs that arise is invaluable. I wonder if it would make sense for you to partner financially with any of the groups you volunteer with? (Not sure what type of volunteering it is.) We’ve found the most satisfaction from being able to give time and money to the same group. It also helps us feel more confident about where our money is going. I’m a little ashamed that I haven’t been more giving. I gave $1,500 last year, which is the most I’ve ever given, but really isn’t all that much, especially considering my income. I’ve made excuses like “I’ll give more when I’m in a higher tax bracket”, but that mentality seems pretty self-serving and goes against the purpose of giving. Thanks for your honesty, TJ. It’s good that you thought to give something last year! Unfortunately this area gets a lot less attention and emphasis than other personal finance topics. I’d encourage not to feel guilty, but to move forward with finding a good organization to donate to! We like to give to domestic and international organization, but my wife & I are also wanting to do more local charity donations as well. We recently asked a local school (got the idea from a family friend) if they could let us know when children with true needs needed something like a winter jacket, etc. It’s better than just writing a check, but, still allows charity in places where volunteering time isn’t possible. That’s great you have some organizations you give to regularly. I’d like to get more involved with local charities, as well. That’s a wonderful idea to provide winter things for children in your community who need them. We try to balance the three types of giving. We give our time to organizations and also to mentoring teenagers in the community. We give constantly to a few organizations. One we have partnered with for 11 years, another for 9, and one for 4 years. It is great to see those growth and impact that giving has. Then we have a giving fund for spontaneous gifts. I wrote a post about it last week. http://www.montanamoneyadventures.com/the-giving-fund/ But that helps us lean in to the people and situations around us and plan ahead so we can help. We transfer money into that account each month so it is ready. I think all three are important. And really all three make our lives better. We could lease a very nice car for the amount we give, but the giving is money better spent. It is very rewarding to have a long-term relationship with a charity or organization and see how it grows over time. One group we give to has expanded quite a bit and it’s nice to know we’ve been a small part of that. I loved your post on your giving fund. We try to be spontaneously generous as needs arise, but having a fund set aside for it is a great idea. We’ve also found it satisfying to be able to give both time and money to some of the same organizations, and it helps us feel more confident about where our money is going, too. Committing to giving on a regular basis is really helpful to ensure I follow through. I also have regular activities I participate in each year. I organize a donation drive for a local homeless shelter at the same time each year – it’s expected and it gets done since it’s an annual event. Yes, I know we give more because we have agreed to up front and even pledged to the organizations. I love the idea of coupling the giving of both time and money in an annual way so that you plan ahead for it! I hope to get our children involved in some type of service to the needy in our community when they are just a bit older. We give to United Way through my workplace monthly pay check. We are about to open our Donor Advised Fund through Fidelity. It is actually a more practical solution than the similar charitable giving option offered by Vanguard. I am not quite sure why the Vanguard option is so sky high to start the fund. This is one place where Fidelity wins over Vanguard. How cool that you give directly out of your paycheck, and that you are opening a fund through Fidelity. I didn’t realize the Vanguard option was expensive to start; good to know! EXCELLENT point! We have a handful of charities that we contribute to automatically when I get my paycheck. It may not be a ton of money at any given time, but I think charities greatly appreciate the consistency. I know if I was running a nonprofit I would really appreciate those consistent givers even if they could only afford or only choose to give a little bit. Really helps with planning purposes and saves money on having drives for one-time gifts. What a great way to look at it, from the charity’s point of view. I’m sure it is much easier for them to plan, and saves on fundraising costs, which means more money going toward actual programs. That’s wonderful that you give automatically to a number of charities each pay period! We are not necessarily great at choosing our charities, although I’d like to get better. Other than our church and the school’s backpack buddies (food for food insecure kids on weekends and holidays), our main giving impetus seems to be whatever charity Little Bit’s school or scout troop raises money for. And our time donations are mostly church and school oriented as well. We probably do need give it more thought. I think you’re off to a great start with giving both time and money to two important parts of your community–your church and local school. I like the idea of donating to both local and international charities. Local, since it’s my own community. International, because in some places people have a lot less access to government assistance and other support systems compared to here. Yes, you are right that planned giving can seem cold or robotic because of wanting it to come from the heart like the verse you are quoting. I think you can decide out of “an overflow of the heart” to give consistently in the future. But it’s also important to stay sensitive to needs in the moment. I loved Ms. Montana’s idea about having a giving fund for the needs that arise beyond your planned giving. I also find that giving in a planned, consistent way over time has softened my heart toward responding to unexpected needs. It is a paradigm shift, though. This is one of those subjects where I don’t particularly follow the crowd. I am not religious, per se, and do not practice charitable giving. I also do not pretend that at some point in the future I will give, or that I have at some point in the past, etc, etc. I like to confess it right up front: I do so little charity work either in donation or in time, that it might as well be none. I have taken a different view. Rather than earn a 100,000 a year, and donate 10,000 of it, keeping 90,000 for myself, we choose to work less hours and therefore only earn an income in keeping with our lifestyle needs. My thoughts on this are that if I can work 60 hours a week and have excess on which to tithe, or I can work 30 hours a week, have no excess BUT someone else is able to have a 30 hour work week of gainful employment, it is a much larger win. Essentially, rather than garnering an excess, of which I then dole out a portion I avoid earning excess to begin with, allowing others to earn it themselves. When I have ‘enough’ there is no need for me to gather more to myself. Let someone else have that opportunity. I often think of Dave Ramsey, and the Pharisees when I think about this topic. His five million dollar home appalls me, personally, but is acceptable under the tithing and charity guidelines he follows. It would not be under my personal guidelines. I feel nothing for the man who gives away 50% of his earnings, but still lives a lifestyle of incredible excess… while discussing his own virtue. Very interesting viewpoint, Morgan, and I appreciate you sharing it. There is a lot of wisdom in knowing when enough is enough and foregoing income you don’t need. We have also limited our work hours, though some of our reasons are different. Even before we had children I worked part-time to make time for other things, and because we simply didn’t need more money. However, in many salaried fields, it’s possible to work 40 hours, but not less, so I don’t think it’s always a choice between working “extra” or part-time that would open jobs for others. Additionally, we support several international charities and there is no way for people in rural India, for example, to take advantage of employment here. Even domestically, there are many people such as children or the disabled who do not have the choice to benefit from employment. So while I think it’s very admirable to live simply and not be greedy, and I respect that you openly own your convictions, there are exceptions to your proposed solution. I believe you are helping some people gain employment, while we are able to help others who do not have access to those same jobs. I understand your qualms about the spending of the very wealthy. I’ll just say, I’m more concerned about those in need getting help than I am about some rich people feeling smug or self-righteous about their giving. Thanks again for sharing your thoughts. Yes, I agree that it is overwhelming to contemplate where, how, when, and how much to give on a regular basis, especially since choosing a great organization to trust with your money can take a little research. It’s awesome to hear from someone so close to early retirement that you can give generously along the way and still reach FIRE in good time! And that giving is worth more than leaving the workplace ASAP. Awesome post, Kalie! We are passionate givers for the reason of spreading the love of Christ to others. It’s one of the main reasons we want to achieve financial independence. I think giving even when deep in debt is important, but in our case we always sought God before making a decision about giving while deep in debt. He always honors an honest heart that works to see Him fully. We are passionate about giving for the same reason, Laurie. We feel that giving is the only suitable response to our faith. Thanks you for sharing from the experience of giving while deeply in debt. I agree that the heart attitude of seeking God’s will is most important when making those difficult, sometimes complicated decisions in less than ideal circumstances. Good post. We budget for charitable giving as part of our monthly expenses. Last year, nearly 15% of our expenses were charitable giving including the 2 kids we sponsor. I find that unless you budget for it, charitable giving cannot be consistent. Thanks for putting this out there! Like Laurie (a couple comments above) and yourself, as a follower of Christ, I believe giving of both time and money to help others both with physical and spiritual needs is part of how my family should live. I do feel that there is a place for both ongoing planned giving and spontaneous giving for specific immediate needs. Planned giving allows good organizations to make plans also, rather than working with too much uncertainty. Our strategy for financial giving is to allocate a percentage of our gross income for giving, and then split that up between our church, various service/relief organizations, and support for friends who are sharing God’s love elsewhere. We also keep a portion each year unassigned to have it available for additional immediate/short term needs that may arise… and if some is left at the end of the year, we send it to one or more of our “regular” organizations. One of our biggest challenges is limiting the number of organizations and people we support to something manageable. I figure if I can’t at least find time to read over the updates/newsletters then I’m spread too many ways! There are so many people doing so many good things; I want to be a part of them all! 🙂 …but of course realize that isn’t feasible. We’ve ended up with most of our support going towards organizations whose mission inspires us and which we have some personal connection with (either via serving with them ourselves for a time or because they work in our local community). As we’ve worked to increase our income over the years, we’ve chosen to increase the percentage (not just the dollar amount) of our income designated for giving. This helps me keep my tendency toward greed in check (my nature is to hoard, so this is really good for me), and keeps us mindful about keeping lifestyle inflation under control. Some folks (Randy Alcorn being one I’m aware of) advocate picking a $ amount to live on and giving away anything above that. We haven’t taken it that far, though I find that approach admirable. I do find a constant mental/emotional/spiritual tension between my tendency to spend/save more and a desire to give more. That’s awesome to hear you are so passionate and strategic about your giving! We also have personal connections, one way or another, to every organization we give to regularly. That’s a great way to feel confident about where your money is going, when you or a friend has seen the work firsthand. We do the same as you, appropriate a percent of our gross and divide it between causes. And it is hard to choose! Ron Sider suggests a graduated tithe in Rich Christians in an Age of Hunger, and Randy Alcorn talks about tithing on your benefits. I think that’d be pretty hard to calculate with today’s crazy healthcare situation, but it’s challenging to read such generous givers’ thoughts.